The fast-paced script is propelled forwards by a trio of Greek Chorus-like figures, who circle around the space as society’s vultures, picking Sam apart flaw by flaw and creating a controlled but frantic accompaniment to Sam’s actions through their sharp and overlapping critique. However, these three also appear as a multitude of other characters, seemingly fitting the whole of society into these three types of person in a way that’s not so dissimilar to the stereotyping that cripples Sam. Not only do their constant jibes exist as narration to the audience and as voices in Sam’s head, but their involvement in her life is also physical, making the performance much more dynamic and their judgement a lot more brutal. Tom is soon introduced, a masters student who is living in the flat above Sam and who has a habit of playing loud music whenever her young children are trying to sleep. To begin with he is very much of a meek disposition as Sam bursts into his flat, demanding to watch his TV and eat his cereal, but very quickly, perhaps too quickly, the scales of their relationship tip very much the other way, until Sam hits rock bottom. Sam’s character is very effectively composed, both on the page and through Sarah Ridgeway’s compelling performance. Though her exuberant confidence is prominent at the start, we also begin to see the cracks in her demeanour early on, through avoided questions and pauses that last just a little too long. Ridgeway takes Sam from high to low in an extremely convincing spiral, and whilst our judgment of Sam is most often through the chorus that hounds her, empathy towards the young mother is most definitely carved into the script. Although Tom appears timid in the opening scenes, he soon switches from a slightly needy and lonely student into a calculated and manipulative character, and it’s not really clear why until he gives a rushed and dramatic explanation at breaking point. However, the rest of Alex Austin’s portrayal of Tom is skilfully measured and he successfully delivers many scenes that are uncomfortable to watch. The setup of the space is a perpetual reminder of Sam’s feelings of entrapment, and having the audience sat around all four sides of the space creates an overbearingly claustrophobic effect, and the simple and unobtrusive use of props enhances the focus on this atmosphere. Music not only exists as a plot device, with Tom using his music to control Sam, but it also intensifies the oppressive environment that surrounds and engulfs Sam, building up and up until she can no longer take the pounding. Fury is a powerful and often uncomfortable performance that effectively explores the influence and danger of stereotyping, as well as continuously playing with the audience’s conscience and challenging them to make their own difficult judgement of Sam’s situation. 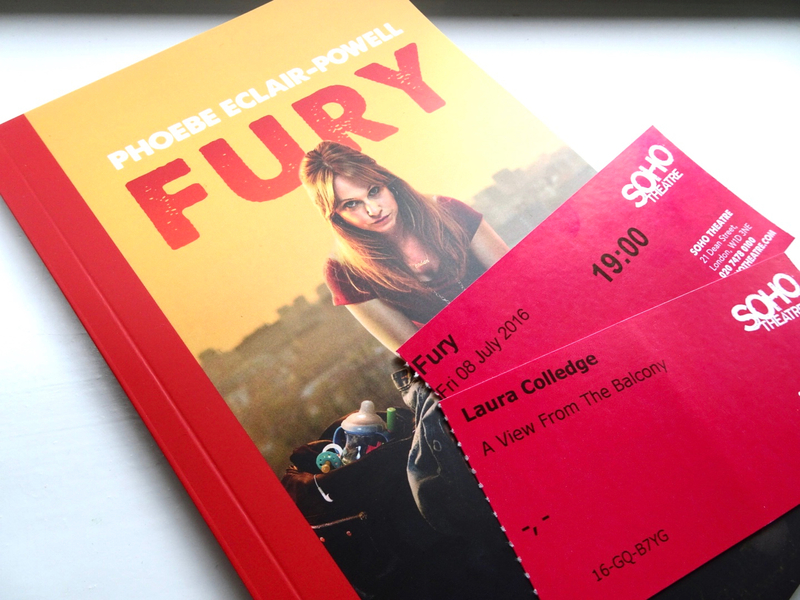 If you want to catch Fury, it’s on at Soho Theatre until 30th July, as part of the Who Runs the World? Girls – Autumn Season. Huge thanks to Theatre Bloggers for making this review possible.